Alicia was born in Weatherford, Texas and moved to Huxley, Iowa at the age of 3. She has always loved horses, and has been riding since before she could walk. Alicia started out riding western, but at the age of 8 decided she wanted to learn to jump, so she worked at a stable cleaning stalls in return for taking English lessons, and has been hooked on three-day eventing ever since. 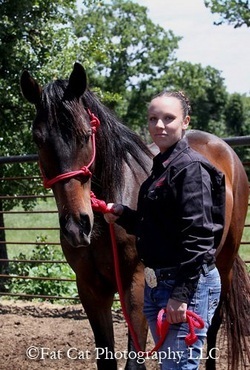 Alicia attended Kirkwood Community College to study equine science, and served our country in the U.S. Army, where she still found time to ride. Alicia trained her first horse at age 11, and is happy to be training once again. Alicia's horse for the challenge is Dancer. Jared grew up on the Doenges Ranch (in between Bartlesville and Nowata) until the age of 18. The ranch kept a working remuda, which interested him in horses and got him to where he is today. Jared has been starting colts since the age of 13 and have ridden multiple horses and many customer horses over those 9 years. Jared attended Kansas State University in 2009 in Manhattan, KS. where he worked for the Purebred Beef Unit at Kansas State as well as rode and started horses for the Equine Unit. After getting married, he moved to Chelsea. Jared appreciates the opportunity to be a part of this competition and looks forward to gaining more experience from it! Jared's horse for the challenge is Solid Gold. Terri's horse for the challenge is Nikki. Jessica is a 32 year old stay at home mom. She was born in Tulsa, OK and now resides in Sparks Oklahoma. 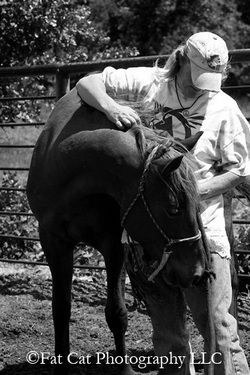 She has worked with horses for many years now and trained several as well. Through following Clinton Anderson and Chris Cox, her relationship was the most important part of training she did with her horse. She uses non aggressive training measures to teach and train. She has a 13 year old mare that she trained herself and recently been started on barrels. Jessica says “she is an awesome horse.” When not training, Jessica enjoys barrel racing, fishing and spending time with her husband and daughter. Jessica's horse for the challenge is Saturn. 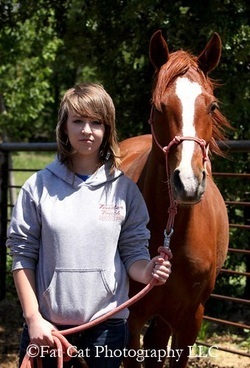 Rachel is 15 years old from Muskogee, OK." “Horse Crazy” Rachel got her first horse "Angel" when she was six years old. Angel was a "never-been-touched" 2 year old quarter horse. Using Monty Robert's techniques, she helped her mom to break Angel, and continues to help others with training, breaking, and learning the joys of horsemanship. Rachel’s current horse is a twenty-two year old Arabian mare, "Lady Domino”. And she feels that each horse is an opportunity to learn something new. When not riding or sorting, Rachel works at the family-owned carwash business. She also enjoys photography, riding four-wheelers, fishing and being with friends. In the future she plans on attending Connors State Equine program. Rachel is excited to be a part of the Blaze Trainer's Challenge, looks forward to meeting some new friends, and not just the ones that whinny. Rachel's horse for the challenge is Ami. 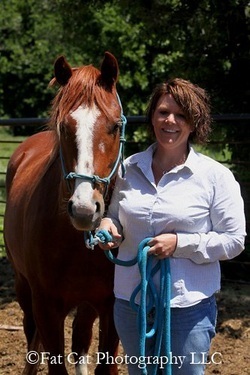 Brittany has been training horses for the past 14 years. She has done everything from showing in Western classes to playing collegiate polo at Oklahoma State University. 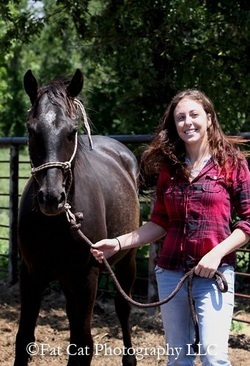 Brittany has experience with many horse breeds including Arabians, Tennessee Walkers, Mustangs, Thoroughbreds, Missouri Fox Trotters, POA's, Argentine Criollas and Quarter/Paint Horses. Brittany's horse for the challenge is Jet. Jason is from Dewey, OK, where he is the founding pastor of Kingdom Life Church. Married to Heather Rene', they have three children Chase 15, Madi 14 and Jackson 9. 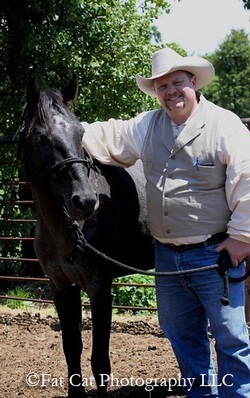 Prior to pastoring he served as a police officer for 12 years in Norman OK and in Dewey OK.
Jason started working with horses at a young age, broke his first horses at age 13 and did it the "old fashioned" way, just let them buck until they were done. 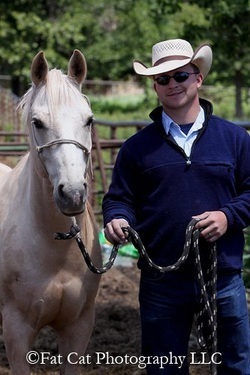 He was introduced to natural horsemanship a few years ago after attending Chris Cox clinic, and a Pat Parelli colt starting clinic in Fort Worth. Jason says “that training horses has taught me about myself as far as patience and dealing with people that are difficult. 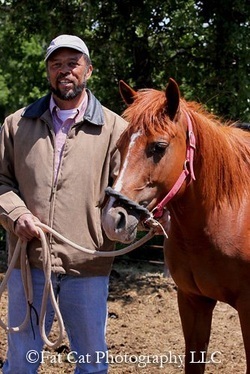 Many times I feel the horse is actually training me also.” He trains horses to be used as working ranch horses, and is looking forward to working with his Blazes horse. Jason's horse for the challenge is Hadassah. Ann got her first horse at age 16 and has never outgrown her love of horses and riding. She would trade stall cleaning for riding, or find friends with horses that would allow her to ride. She also took lessons, did odd jobs around race barns and show barns grooming horses just so she could be around them. 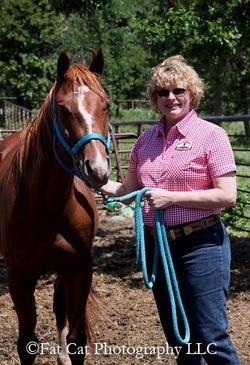 While working on her accounting degree at Montana State University Ann had the opportunity to take equine studies classes for all her electives. Ann is married to Tony, and together they enjoy trail riding and giving “Trail Ride Tune Up” clinics. Through their clinics, she has trained some very nice trail horses for people and has been able to help many first time horse owners find their perfect trail horse. Ann’s goal in the Ride to the Rescue Challenge is to train a good steady trail horse for someone to adopt and enjoy. Although she does not take outside horses in for training, she would be happy to help you with your own horse through lessons or clinic participation. Ann can be reached at their website: www.fourhoofdrive.com. She would also like to thank her generous sponsor, Lumber 2 Home and Ranch at I-240 and Sooner Road in Oklahoma City. Ann's horse for the challenge is Selah. Robert was born in Logan County in 1952 in the town of Guthrie Okla.
His first memory connected to horses was when he was about two years old and someone put him on one of the work horses that were used to work the fields. He started to learn how to ride racehorses from his brother at age 12 and won his first official race at 16 in Cleveland Ohio. Robert rode races throughout Colorado, Nebraska, Wyoming and Oklahoma, and then received his racehorse training license in 1975 in Ruidoso, New Mexico He raced in New Mexico, Colorado, Iowa and Oklahoma until 2004. The only time that horses haven't been a part of Robert’s life was two years spent in the army, in 1972-1974. Robert's horse for the challenge is Darcy.